Custom-enclosure fabricator Haewa Corp., Duluth, GA, represents the new generation of metalforming shops and panel builders utilizing the latest forming and fabricating technologies to radically improve workflow, accuracy and output. Traditionally, such enclosure suppliers would stock a variety of standard models, and modify them with hand tools to suit a particular customer’s requirements. This scenario, however, can cause a bottleneck in production workflow. Haewa recently addressed this issue by acquiring a Steinhauer eCab WorkCenter for CNC milling, drilling and engraving, all controlled by a Siemens Sinumerik 802D control. Says Haewa CEO Clemens Heinrici: “We needed the CNC machine to customize our work orders and respond to very short lead times from most of our customers. That’s the rule, not the exception, for us.” The eCab WorkCenter, which uses a single, versatile cutting spindle that works in tandem with a side-mounted tool magazine, can process flat sheetmetal as well as pre-fabricated boxes. The Siemens control can be programmed in less than 10 min. for new jobs. Heinrici credits use of the eCab WorkCenter with returning more than a 50-percent reduction in that critical “time to first hole in the workpiece” scenario, resulting in a substantial increase in productivity. 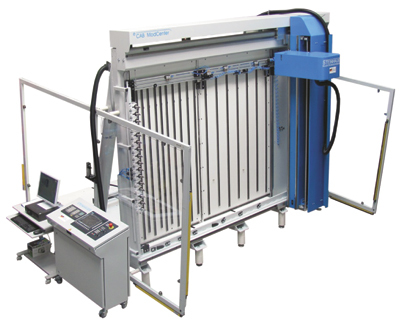 Onboard the eCAB WorkCenter, the CNC operates a three-plus-one axis working tool, designed specially for the flat materials processed and the specific enclosure modifications performed by Haewa and other panel builders.